Thanks Lisa, it's always evolving. I'm trying to make it more functional every day. I love that! I'm always a fan of woodgrain and besides that, it looks great! A lot less clinical looking than the white boards. Those always make me think of hospital rooms and business meetings. Agreed, white boards are too clinical and uninspiring, especially if your work is creative! This alternative is a lot more homey. What an awesome idea! I've never seen a wooden dry erase board. Pinned! Forgot to put her link in the post, gotta update that soon. Thanks for pinning, Susan! What a great look! I agree that the white boards look like a school or hospital, ick! Yours is great. I don't have any great office solutions other than I have a collection of tin boxes so use them for storage; thread, buttons, stickers, etc. As long as they are there, I might as well use them! I used to do the same thing, now I'm using vintage planters and pyrex to organize art supplies too. I'll continue to share ideas as they arise. Awesome idea! If I have some wood left from my floor I might have to follow your lead;) Thanks for the tip! For our home based company we needed a dry erase calendar midyear (4 months worth) and could not buy any 2012 calendars as all the stores were stocking 2013 already. I printed them off the internet, had them laminated and we tacked them up. When 2013 rolled around I had purchased our new calendar so these were going to be trashed but instead I flipped the four over, and now it is a dry erase note station. Plastic is almost forever so we plan on using this for a long time. It works fab! I would never have thought about using laminate wood though-well done! Great recycle and great no spend. 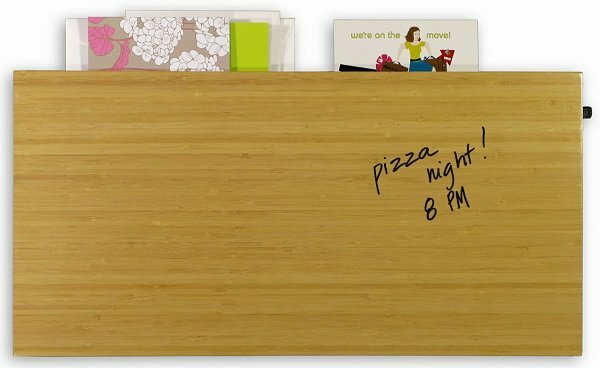 Great idea with the calendars and re-purpose as a dry-erase "board"- waste not want not! I almost did the same thing when looking for a 2013 calendar but luckily found a nice big one at Target. I've tried other methods but a huge calendar for taking notes works best for me. That is such a great idea, gee you're a clever cookie. I want to do it now just because it's cool, perhaps with a stencil of woodlands creature or scene at the bottom so it looks like a piece of art too. Ahh! This is such a fabulous idea. I cannot wait to add this to my craft room. Yay! Do reply with a photo if you install one. OMG genius idea!! I've gotta try this! What a great way to make an attractive dry erase board. Who knew you could do that with faux wood floor boards? 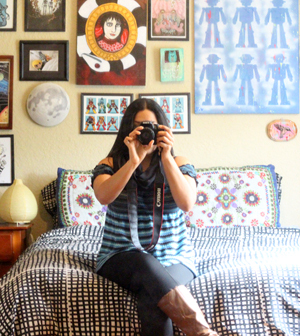 For your rug, have you considered making one out of old tee shirts or sheets? Here is one example: http://www.craftpassion.com/2010/03/recycle-tutorial-woven-rag-rug.html. This one is woven. There are others that are braided. If you don't have a stash of old sheets or tees, you can get them inexpensively at your local thrift. I have from t-shirts, but not sheets. That's a great idea and the rug in the link actually looks like a nice thick one that won't scoot around on the hardwood floor all the time. Gotta work on that one at night while my roommate and I do our nightly ritual of re-watching cartoons from our childhood ;) haha. Thank you for sharing the link!